To battle homelessness, one city came up with a controversial alternative to giving spare change to panhandlers. Pasadena, California, has repurposed 14 parking meters to collect change for the city’s homeless programs. 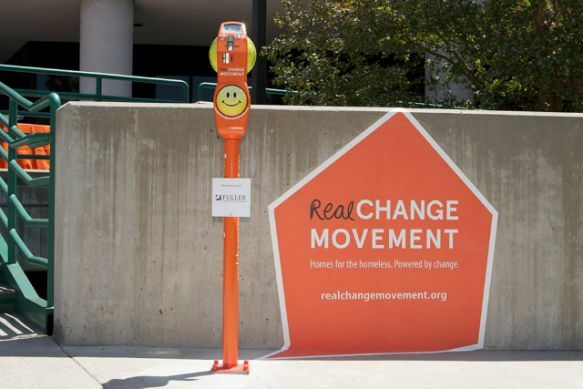 Painted orange and decked out with smiley faces and motivational maxims, the meters, installed on sidewalks, were designed to promote nonprofits that assist the homeless. “This is a clear alternative where people contributing know that all the money will go to effective services,” Pasadena Housing Director Bill Huang told the Los Angeles Times. The city didn’t fund the campaign, which, including design and marketing, cost about $350,000. Students from the Art Center College of Design in Pasadena designed the donated meters, and sponsors such as East West Bank paid for them. The program doesn’t expect to collect a large amount of money—two working meters have only raised about $270 over three weeks. The main goal is to help out organizations that serve the needy while raising awareness. Huang argued that supporting such groups might be a better option than just giving out spare change. He said that many panhandlers use handouts for drugs and alcohol. According to the U.S. Interagency Council on Homelessness, nearly half of all homeless people suffer from substance abuse. Not everyone agrees with the project’s approach. Paul Boden, who heads a homelessness advocacy group, told the Times that the meters, which he called “asinine,” were designed to push the homeless out of cities. Similar meters are in place in San Diego and Denver, where they were installed in areas popular among panhandlers. “If we would get serious about addressing the actual economic and social issues that we find so off-putting, we wouldn’t need meters,” Boden said.